Here is a chance to buy into the world renowned bank vault quality that is the Mercedes Benz W123 for less than 7 monthly payments on a new Camry. Anyone that was around in the 70s or 80s will remember their favorite dentist or math professor driving one of these. The low asking price and E-Z parts availability of these cars ensures that this one can be used as a daily beater without too much difficulty…well at least in cooler weather, as no mention is made of working AC. 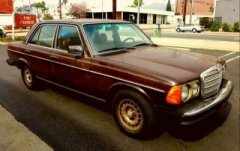 For Sale in the sunny San Fernando Valley in SoCal is this 1981 Mercedes Benz 240D with a 4-speed manual transmission offered for $2, 500. The front shot of the car shows a beautifully straight (minor dings and dents notwithstanding) car with lovely Chestnut brown car that beautifully pairs with the car’s timeless lines. Some of the body panels have paint that is a little hazy…but if it is OG Mercedes Benz Paint, an afternoon with some mild paint compound will bring out the shine like it was 1981. The W123 body style Mercedes Benz came in several different engine combinations, but the ones most likely to be around today are the 240D and 300D. This manual trans 240D is the one you want due to a much simpler vacuum system as compared to the 300D. Vacuum is used to lock and unlock the doors on the 300D’s…this 240D won’t give you those problems. The Manual transmission will give you freedom from the eventual expense of rebuilding an ugly power robbing automatic. The interior shots provided show a generally clean tan interior, made from industrial strength MB TEX vinyl. 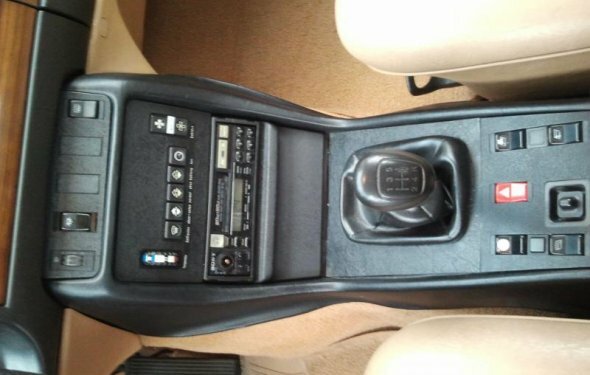 The tan interior complements the dark brown exterior nicely...sort of like a chocolate and peanut butter Reese’s candy. The owner claims only 235k miles. If the mileage is correct this car should have plenty of life left with only a moderate amount of tinkering. This car has been languishing on craigslist for weeks and weeks…so the owner is probably going to be agreeable to some negotiation. I believe it was first being offered for $3900…I would try to get it for around $2000 bucks. Someone please buy this thing so that it quits tempting me. Originally written by Al and published as 4-Speed Tank: 1981 Mercedes-Benz 240D W123 on Daily Turismo.